Posted By PA Breast Cancer Coalition on March 16th, 2012 at 9:02 am | 220 comments. When I was diagnosed with breast cancer I was a 40 year-old single mother of two, a 3 year-old and a 5 year-old. They were my touchstones. Every decision was based on what would give me a better chance to be here for them. My first baseline mammogram detected the breast cancer. I had a needle localization biopsy and was told that the margins from that procedure were adequate and I could proceed to radiation and tamoxifen. I wasn’t comfortable though and I went to Dr. Norman Wolmark for a 2nd opinion. I had read that the risk of recurrence after a mastectomy was less than 1% as compared to 5% with a lumpectomy. One of the things I love best about Dr. Wolmark is that he never leaves the room until all your questions are answered. After discussing it with him, I decided to have a mastectomy. During that surgery, previously undetected cancer cells were found deeper in my breast. Listening to my own inner voice was the right thing to do. I live 250 miles away from my closest family but my sister, sister-in-law and mother took turns coming to stay with me. A friend made a schedule for others in the community to drive me to appointments, cook meals, and do whatever I needed. I had purchased new wallpaper for my living room and when I came home from the hospital I found that they had put it up! I’m private and hadn’t planned on sharing so publicly about having breast cancer. But after my surgery my 5 year-old daughter (who is now 14) touched my face. She said “I’m like you. Will I have breast cancer too?” That motivated me to support finding a cure. That, and the desire to pay back for all the help I received. Merrilynn is Community Relations Director at Titusville Area Hospital and represents Crawford County in the PBCC traveling photo exhibit. 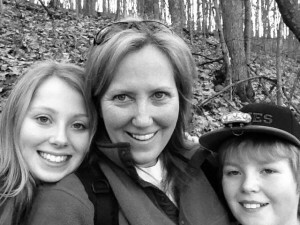 She loves spending time with her children and running. Posted By PA Breast Cancer Coalition on March 16th, 2012 at 9:01 am | 532 comments. Each year the journal CA, A Cancer Journal for Clinicians, provides an analysis of cancer statistics for all cancers. Breast cancer continues to be the most frequently diagnosed cancer and the leading cause of cancer death among women worldwide. This initial report shows that the cancer burden continues to increase worldwide, attributable in part to the fact that people now live longer than in past generations. In the US, cancer incidence has been stable for men and has been declining in women by 0.6% yearly since 1998. 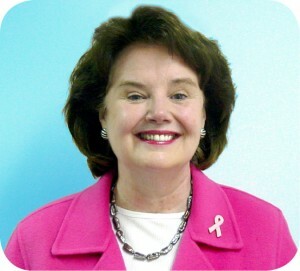 In the United States for 2011, breast cancer accounts for about 30% of diagnosed cases and 15% of cancer deaths. Pennsylvania has one of the highest rates for both incidence and death from breast cancer in the US. Posted By PA Breast Cancer Coalition on March 16th, 2012 at 9:00 am | 176 comments. PAHomeRunDerby.org! Start a team and ask your friends to join, create a special page on our website about why you are participating, solicit donations through Facebook, Twitter and email, and track your progress online. We are also looking for a few good volunteers. If you and your co-workers, your children, or your neighbors would like to shag a few baseballs in the outfield, we can use your help! Volunteer registration is also available online. Be sure to check out our July touring schedule and mark your calendars now! If you have any questions or need assistance through the registration process, call the batter’s box (ok, not really) but reach out to Kevin at Kevin@PABreastCancer.org or 800-377-8828 x109. Take the PBCC’s Online FREE Treatment Course Today! 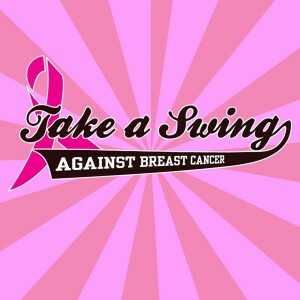 Posted By PA Breast Cancer Coalition on March 16th, 2012 at 8:59 am | 201 comments. Did you know that FREE treatment is available for uninsured and underinsured women battling breast or cervical cancer here in Pennsylvania? The PBCC is working to spread the word on this important program to all by offering a FREE online course. Check out our video! Nurses and social workers who take the course can earn free credits. Take the course today! Those who take the course will have the opportunity to learn the ins and outs of this important program, and how it serves as a lifeline for those who are uninsured and underinsured battling breast cancer. As part of the course, you can review real-life case studies and read inspiring stories from survivors who benefitted from the program. If you have any questions or problems with the course, please contact Jen at Jennifer@pabreastcancer.org or 800-377-8828 x101. Please note that the course is not compatible with mobile devices. Posted By PA Breast Cancer Coalition on March 16th, 2012 at 8:58 am | 983 comments. Contributing to potentially groundbreaking research is as easy as checking a box on your PA state income tax form, thanks to the PBCC’s Refunds for Breast and Cervical Cancer Research program. Every penny raised goes to fund grants to researchers working right here in the state. Join us on April 2 at the Capitol in Harrisburg for a press conference to present 2012 awardee Dr. Allan Lipton with a grant for $50,000. Dr. Andy Minn and Dr. Takemi Tanaka were each presented with $50,000 awards at an event in Philadelphia’s City Hall in February. Last October, Dr. Craig Meyers, a previous Refunds for Research award recipient, announced the discovery of a virus that kills breast cancer cells – a groundbreaking discovery that could bring us closer to a cure than ever before. Over $2.8 million has been raised through the PBCC’s Refunds for Research program thanks to the generosity of Pennsylvania’s taxpayers. You CAN make a difference. Help us reach $3 million this year – look for line 35 on your PA state income tax form and donate all or part of your PA state income tax refund to the PBCC’s Refunds for Breast and Cervical Cancer Research. Volunteers make the world work! Posted By PA Breast Cancer Coalition on March 8th, 2012 at 3:24 pm | 1095 comments. I don’t need to tell you that the PA Breast Cancer Coalition is the only statewide nonprofit dedicated to finding a cure for breast cancer now. I don’t need to tell you that we hear from countless women daily about the effects of breast cancer. But I do need to tell you about our wonderful volunteers that make our work possible. With such a large state to work in, we are tasked with what seems impossible with eight full-time employees. Volunteers make the mission of the PBCC achievable. In 2011, we had 302 individuals from all over PA give up their time for a greater good. Jobs included reviewing Refunds for Breast Cancer Research grant applications, presenting or moderating a workshop at our conference, staffing an information table at a health fair, speaking at a fundraiser, shagging baseballs at a Home Run Derby, assembling and customizing Friends Like Me Care Packages, and many more. The only thing we can say (and we say it every day): thank you. Thank YOU for donating your valuable time to the mission of the PA Breast Cancer Coalition. In total, we had 1738.5 hours logged by volunteers across the state. That is OUTSTANDING! 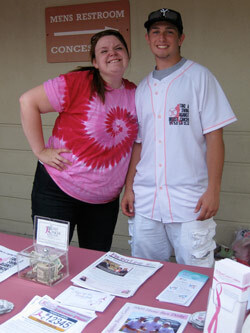 Volunteers saved the PBCC $37,134.36 in 2011! I don’t need to tell you that this is incredible! Thanks to people like you, we are able to keep our doors open and serve the women and families of this great state! Stay tuned for opportunities to get involved at various events across Pennsylvania. 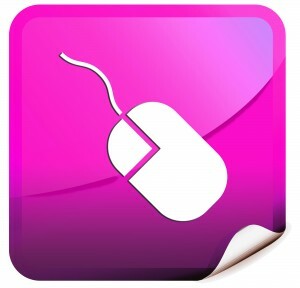 If you don’t already receive our monthly e-newsletter Pink Link, sign up! And if you’re interested in volunteering, complete our interest survey and we’ll be in touch!